Cooking something for Diwali is always Tricky. It should be light on stomach ( since everyone is so full of eating sweets and heavy snack ), should be delicious ( goes without saying) and above all, it should be stand out from the usual stuff (it’s being Diwali !! ).. Puts an unnecessary pressure on me and I always end up making something which is lacking in atleast one of the three parameters above. Like this time, I was so adamant to make Gulkand Shrikhand since the day I got to taste it at Preeti’s home. We were there for a Brainstorming session for our upcoming event – Bloggers Buzz UK. Ohh ! And by the way, if you haven’t heard of this event, take a sneak peek here at the dedicated blog Page, and also @ Facebook and Twitter. The fun has just started with a bang and Brands like Total Greek Yogurt, Hotel Chocolate, Dream Cakes and Popchips are coming up together as Sponsors for this Grand ( a bit ! ) venture of ours. Look out the Blog space for more details, and if you are somewhere near London, or even in the UK.. This is an event you must not miss…. Coming back to Shrikhand… Yes, I was telling you that since the day I had this at Preeti’s home, I got so hooked up with the taste. But the method of preparing this exquisite delicacy was a bit time taking, since it requires hanging the Curd for at least for 5-6 hours before mixing in with flavours, else the thick consistency is not achieved. I chose the shortcut method and bought 2 pots of Greek Yogurt, the fat free version. Though it was not the traditional texture, thick and creamy, yet I got the pleasure of making the healthy Yogurt dessert I was longing to make for long. Pour in the fresh Curd into a Muslin/cotton Cloth and hang in tied for 5-6 hours or overnight. I have seen people hanging it around their kitchen sink tap overnight, so that might be a good idea. I am going to try it myself next time. When you open the cloth, it should be very thick, almost like Paneer textured Yogurt present in that piece. Mix all the above ingredients into it gently. Be careful, not to stir it too much and vigorously. It should be gentle swirling round. Keep in Refrigerator for atleast 4-5 hours, to serve it shilled. Garnish with chopped nuts and rose syrup before serving. quick & tempting dessert,love always!! Iam back to blogging.plz visit my space n check out ny new FB page.. Very interesting twist with the gulkand… a shrikhand truly made for rose lovers! I like that bowl of shrikand. In fact i like it so much that i may come and rob your house tonight. Shrikand Smugglers on the prowl. Beware. I agree with the texture bit..but for us Gulkand Shreekhand always goes well!! It just vanishes from the bowl!! Loving all the colours here.Nupur…your photographs double it’s appeal! !Your kaju katlis’ are pending!! love this delicious texture and making it with greek yogurt has made it much quicker and easier!!! Looks awesome..luv the gulkhand flavor. woww.. yumm! very tempting dessert..awesome clicks n presentation! Mindblowing rose flavoured shrikhand looks irresistible. my family loves shrikand. I never tried making it. Yours look too tempting. I am your new follower. The photographs, the blog everything looks fantastic and outshine..!! I’m following your blog too..
i love the pictures.. so bright and pretty! Greek yogurt taste much better then regular one. I always use that one. love the idea of adding gulkand in it. This sounds delicious! Gulkand is such a special ingredient. And I loved the fact that you experimented with Greek yogurt for Shreekhand. Happy New Year! Beautiful blog you have Nupur! Happy to follow u..! 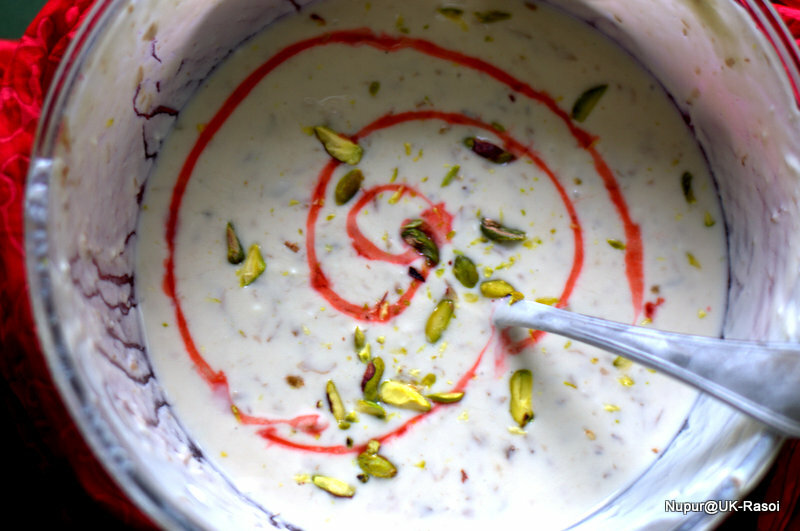 Now I’m again tempted to eat some Srikhand, I love the pics and the easy prepartions!